A group of police officers from a Florida town responded to quite an unusual call Thursday evening. PEMBROKE PINES, Fla. (WPVI) -- A group of police officers from a Florida town responded to quite an unusual call Thursday evening. Officers at the Pembroke Pines Police Department received a call from an off-duty Customs and Border Patrol Officer who had noticed a large snake making its way across a roadway. Upon arrival, Officer Joey Cabrera located the snake - a 12.5-foot Burmese python. Officers were able to secure the snake, and it was taken into the custody of a licensed python removal contractor. 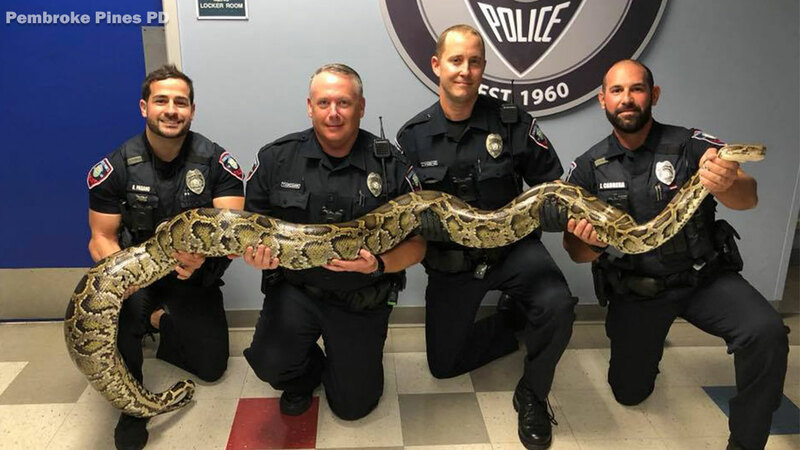 The Pembroke Pines Police Department took to Facebook Friday to remind residents that while snakes may be a common sight in Florida, Burmese pythons can put local wildlife, pets and even children at risk and that you should never approach a snake of any kind.